Hi everyone! I’ve been busy over here creating some more fun digital scrapbooking kits for you! This is my first mega collection and I’m so excited to share it with you today! 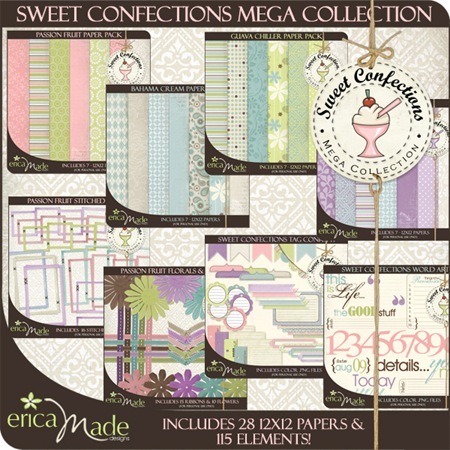 Introducing the Sweet Confections Mega Collection! I’ve broken it up into 4 separate paper packs, and 4 separate element packs so you can mix and match, then at the very bottom you’ll have the opportunity to grab the entire Sweet Confections Collection if you can’t resist it all! Here we go! First up is the Bahama Cream Paper Pack. It includes 7 lovely blue and neutral 12×12 300dpi .jpg digital scrapbooking papers. 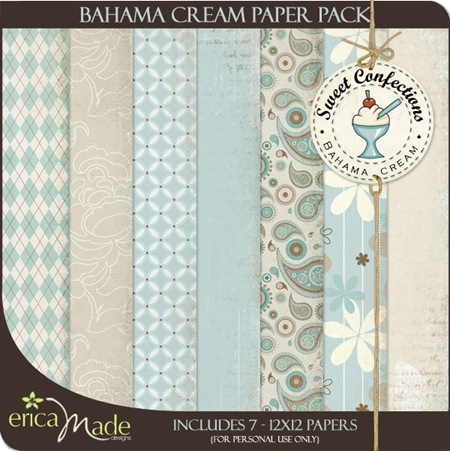 Get the Bahama Crème Paper Pack for just $1.99! Next we have the Passion Fruit Paper Pack. This time I went with a fun pink and lime mix. It also includes 7 12×12 300dpi .jpg digital scrapbooking papers. 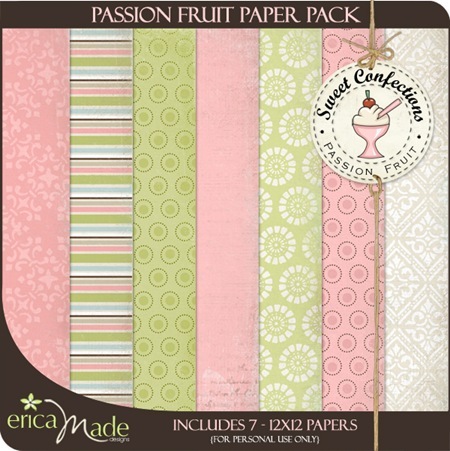 Get the Passion Fruit Paper Pack for just $1.99! Grape Soda is one of my new favorites! I absolutely LOVE the mix of purple and blue in this kit! It has 7 12×12 300dpi .jpg papers. 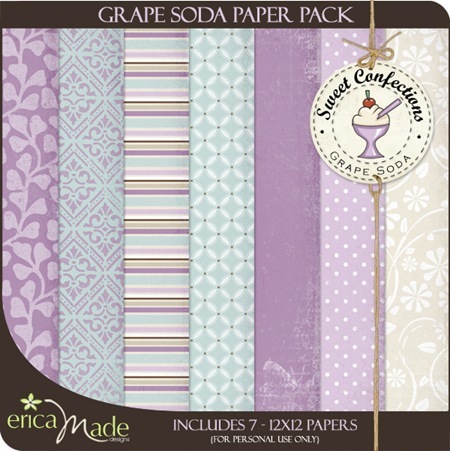 Get the Grape Soda Paper Pack for just $1.99! And finally we have the Guava Chiller Paper Pack! A nice mix of blues and greens complete this 7 12×12 300dpi .jpg paper kit. Get the Guava Chiller Paper Pack for just $1.99! And to go along with my Sweet Confections Papers, I have some super cute Sweet Confections Word Art! They come in full color 300dpi .png files. This element pack contains 41 different colored word art elements for you to choose from! 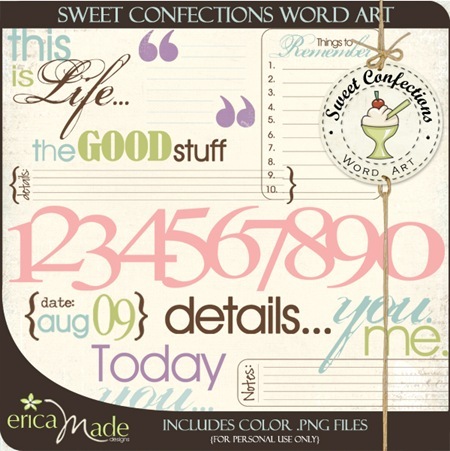 Get the Sweet Confections Word Art for just $1.99! 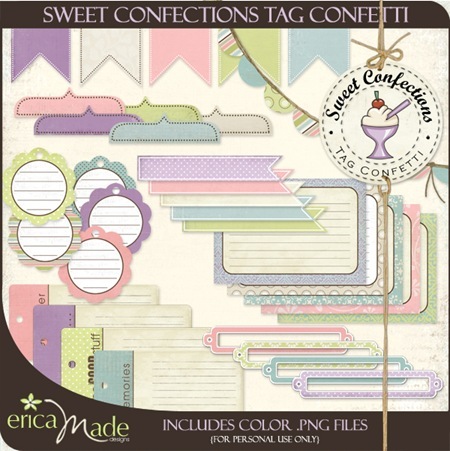 Get the Sweet Confections Tag Confetti for just $1.99! Sweet Confections Florals and Ribbons come with everything you see below! There are 10 straight ribbons, 5 tied ribbons, 5 large flowers and 5 smaller flowers. Each one is a 300dpi .png image. 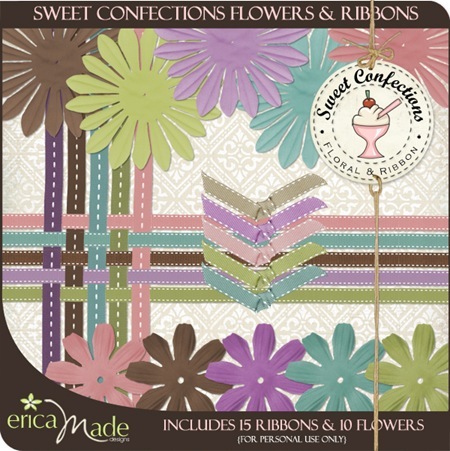 Get the Sweet Confections Florals & Ribbons for just $1.99! This is one of my favorites! The Sweet Confections Stitched Frames come with 16 colorful stitched frames! Drop shadows are included in this set and the files are 300 dpi .png format. 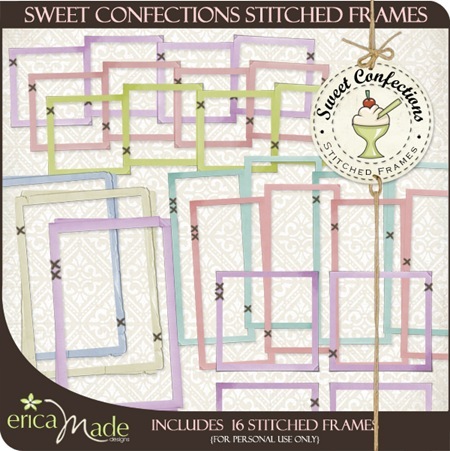 Get the Sweet Confections Stitched Frames for just $1.99! Like them all? The Sweet Confections Mega Collection includes all 4 paper packs as well as all 4 element sets! And just to sweeten the deal, I’ve given you a discount for purchasing all of them together! New to digital scrapbooking? Click here for tips on getting started! Click here to visit my Digital Scrapbooking store! I am totally blown away by your talents! I can’t even wrap my brain around how you do it all! I just wish I knew how to scrapbook;) Are you offering classes? I would LOVE to have a cup of coffee with you! How impressive that you created all these! I just love paper. This whole digital scrapbook idea is mind boggling!